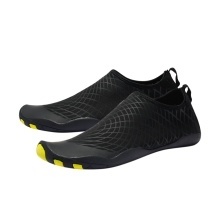 Stretch fabric and soft rubber sole make those water shoes foldable and carriable. They can be folded and don&apos;t take up too much space at all. Just slip on and enjoy the coming summer with your family! Breathable and smooth fabrics with fine stretch on uppers, flexible and comfortable. Wearable and anti-slip rubber sole, protecting your feet from being hurt. Ultra light-weight and high elasticity, very comfortable to wear. With unique holes on the sole to ensure water can easier drain out. Shoe mouth sleek and fits the ankle, slip on design for easy wear and take off. Equipped with soft and breathable shoe-pad inside, not easy to deform. Suitable for beach, swimming, surfing, fishing, boating, jogging, diving and other water activities.